A film by Anders Tomlinson, “Watershed Moments“, is going into post-production. Filming began in Rocky Point, Oregon during the summer of 1995 and continued throughout Upper Klamath Basin and the Klamath River Watershed. Filming concluded in 2008. It was here on a late September day, while waiting to film white water rafters, that Anders learned Southern California can directly effect Klamath River flows. This is not a story of fish vs. potatoes or Indians vs. Farmers. This is not a film of sound bites and confrontation. This is a film of human nature. And in a broader sense it is a film of human nature’s effect on wildlife and habitat. The springs of Upper Klamath Lake and surrounding country including Crater Lake National Park, Fort Klamath and Chiloquin were the first scenes filmed. The Centennial Celebration of the Lower Klamath National Wildlife Refuge, a study of an emerging “Walking Wetlands” on Tule Lake National Wildlife Refuge, and followup interviews with agricultural leaders from the 2001 Klamath Reclamation Project Water shutoff were the last scenes filmed. 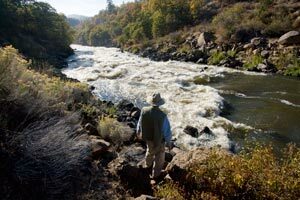 The Klamath Reclamation was the second Federal effort to settle the West. “Watershed Moments” begins with the history of the Upper Klamath Basin and ends with current pressures Klamath Reclamation Project faces from Endangered Species Acts triggered by Sucker fish in Upper Klamath Lake, Coho Salmon along the Klamath River Watershed and water diversions from Trinity River to the Sacramento River and points south. This is monumental story that reflects all aspects of human nature. It is a story of populations in flux. It is a story of unintended consequences. And it is a story of Modern Man. National Academy of Science report.